It was all great but then suddenly, my Galaxy S5 is starting to become sluggish, often freezes and turns off unexpectedly. -- What should you do if you encounter any of these issues with your Samsung Galaxy S5 smartphone? Performance issues like the phone performing slowly, often freezing, unexpectedly restarts or turns off, error message prompts, as well as inability to install or update apps can be remedied with the following workarounds and troubleshooting procedures. You can refer to this guide whenever you need it. A. Remove and re-insert SD card. 1. Drag down the notification bar from the Home screen. 2. Tap on the Settings icon. 5. Scroll to and tap to select Unmount SD card. 6. Tap OK to continue. 7. Power off the phone. 8. Take the battery off the phone. 9. Remove the SD card from the slot. 10. Wait for a few moments, then re-insert the battery. 11. Turn the phone back on and see if the phone's performance improves. 12. Power off the phone again. 13. Re-insert the SD card. 14. Turn it back ON. 15. Now try to observe if the problems ceased to occur. If problem persists, then continue to the next method. B. Check the phone memory. 1. Tap on the Apps icon from the Home screen. 2. Scroll to and tap to select My Account. 5. Tap Storage to view storage details. 6. Check the Overview section and see if your phone has low memory. If so, then proceed with troubleshooting low memory issues on your S5. Clearing the applications cache can also help free up some space and enhances performance on the device. Make sure though that you clear only the application cache and not the application data. Because if you clear the application data, personal settings and information stored on the phone like log-in information will be removed or erased. Clearing of the application cache does not affect or erase your personal settings and information. 4. Tap to select Application Manager. 5. Swipe left to the All tab. 6. Scroll to and tap the app you want to clear cache on. 7. Tap Clear cache to start clearing cache on the selected application. Some applications remain running in the background after you opened them and even when not in used. The more apps running in the background, the more likely they affect the device performance and consume more battery life than others. As a result, the device can be sluggish, often freezes or shuts down unexpectedly. 1. Tap the Apps icon from the Home screen. 2. Scroll to and tap My Account. 3. Tap on My Device to continue. 4. Tap Dashboard to open the dashboard. 5. Navigate to the Power Usage dashboard, then tap Battery Usage. 6. Tap the app(s) you want to force close/stop or uninstall. To close or turn off an app, tap Force Stop. To uninstall or remove app(s) from the phone, tap App Info->Uninstall, then tap OK to continue. Note: Some pre-loaded apps on the device can't be uninstalled. E. Check your device software and make sure it's running the latest version. Generally, software updates are pushed to fix or address existing issues on a device. That's why an upgrade to the latest software version is recommended. Follow these steps to verify if your S5 runs the most recent software version. 5. Tap the System Updates dashboard to view system information. 7. Tap Check now. If an update is available for your device, just follow the on-screen instructions to install update on your device. If problem continues after performing all the recommended methods, then please contact your phone carrier to escalate the issue you have with your phone, for further troubleshooting assistance and recommendations. Performance issues like these are inevitable to any device especially for prolonged usage. So, consider a phone restart or soft reset a part of your regular device maintenance process. The main issue that we are aiming to address in this article is on the Galaxy S5 contacts that went blank or incomplete after syncing with online accounts like Facebook, Google and Corporate email. Contact issues with the Galaxy S5 can be due to a number of factors including an inconsistent network connection, sync online is disabled, poor Wi-Fi network and the like. Sometimes, this happens because the information saved for your contact is incomplete or you are seeing two or more versions of Contact. Our first recommendation is to look into each of the possible causes and ensure none of them is causing the problem. After ensuring the problem isn't triggered by any of the potential causes, proceed with the application of available workarounds and resolution methods to get rid of the problem. Touch Menu from the Home screen. Touch the slider next to Wi-Fi to turn Wi-Fi off. If problem persists, please proceed with the following resolution procedures. Touch the account type that has the contacts you want to sync with your phone. In case you have more than one accounts in the list, touch the account you want to have synchronized. Mark the check box next to Sync Contacts by touching Sync Contacts. Your phone will then start syncing the contacts immediately. Wait until the process is finished, and then exit the sync settings screen. To exit the sync settings screen, touch the Back key. Repeat the steps for any other accounts, when necessary. Look for contacts to test/view details. To do so, touch Contacts from the Home screen. By default, Contacts is located in the favorites tray. Alternately, you can open/view contact details by touch Apps, then touch Contacts. If problem persists, proceed with editing contact's information so it will display properly. Contacts information may appear incomplete or not display properly if the information is incomplete. In this case, you can edit your contact's information to make sure you have every detail to display when viewed. 1. Touch Apps, then select Contacts. Or touch Contacts from the Home screen. Either way is fine. 2. Open the contact you want to edit. 3. Touch on the Edit icon located at the top of the screen. 4. To add, change or delete information, touch any of the fields available. 5. To add a new field, touch the plus (+) sign or Add another field. To delete a field, touch the minus (-) sign instead. 6. To update the changes, touch Save. 7. Now search for contacts again by touching Contacts from the Home screen, or by going to Apps and then open Contacts. If problem continues to exist, then please contact your phone carrier to escalate this issue and for further troubleshooting assistance and recommendations. Read this content and learn how to assign or set custom ringtones and notification on your new Samsung Galaxy Note 4 device. Covered in this guide are methods to change the notification sounds and ringtones, as well as transfer audio files from a computer and set as ringtones or notifications on the Galaxy Note 4. 4. Tap Notifications under Ringtones and Notifications. 5. Tap to select a notification sound you want to use. 6. Tap OK to set or assign your chosen notification sound. 4. Tap Ringtones under Ringtones and Notifications. 5. Tap to select a ringtone you want to use. 6. Tap OK to assign or set the ringtone you chose. You can also assign a ringtone for calls from one contact but you cannot assign a ringtone to contacts stored on the SIM card or phone memory. 1. Tap Contacts from the Home screen. 2. Tap to select a desired contact. 3. Tap the Edit icon (represented by a pencil icon). 5. 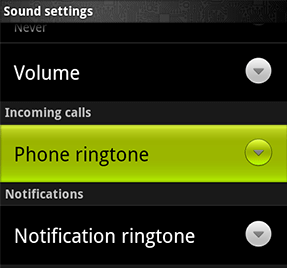 Tap to select a ringtone you want to assign to the contact, and then tap OK.
6. To save the recent changes you've made, tap on SAVE. You can also transfer audio files, music or sound from some devices, like a computer and used these files as ringtones and notifications on your Galaxy Note 4. Follow these steps to transfer audio files and set them as ringtones or notification sounds on your device. 1. Use the USB cable for your phone and connect the USB cable to the phone and the other end to a computer. 2. Touch the Status bar and drag it down, then tap Connected as a media device and tap Media device (MTP), if prompted. 3. Now go to your computer and click Open device to view files using Windows Explorer (for Windows PCs) or else scroll to and open the phone's disk drive and scroll to the desired folder. 4. Search for the desired music files stored on your computer. 5. Drag and drop the music files you desire into your phone's disk drive. 6. You can also add a notification by dropping directly into the Notification folder. 7. Safely disconnect the phone from the computer when audio file transfer is all done. If you are using a Mac computer, you may need to download and install Kies for Mac. To download KIES for a Mac computer, go to Samsung website and search for KIES. When found, click Download for Mac OS and then follow the onscreen prompts to complete the download process. After download is complete, proceed with KIES installation. After successfully installing KIES on your Mac computer, connect the USB cable to the phone while the other end to the computer. If prompted, touch the Status bar and drag it downwards until you see the prompt saying Connected as a media device. Select the check box by tapping Media device. a. Internal memory - select this option if you want to save the audio file to the phone's internal memory. Click the Folder icon to the right of Internal Memory and then navigate to where you want the music or sound file to be placed or stored. b. External memory - select this option if you want to save your music or sound files to an external memory. Click on the Folder icon, to the right of External memory, then navigate to where you want to store or save the music or sound file. Another way to find an audio file is by clicking on Music located under your device name. Now scroll to your desired music or sound file on your computer, then drag and drop the music file(s) into KIES. Once you're done, safely disconnect the phone from the computer. 6. Now choose to complete action using Dropbox or Sound picker. 7. When prompted, tap Always or Just Once. 8. Tap on the music or sound file you want. 9. Tap Done to complete action. And that covers everything for this guide on Ringtones and Notifications management with Samsung Galaxy Note 4. Keep posted for more tutorials of this kind soon in this site. In this guide, we'll help you learn the basics of Samsung Galaxy Alpha's network connectivity, particularly on Mobile Data and Wi-Fi network management. Read on to learn how to use mobile data, and use and manage wireless networks on your new Galaxy device. 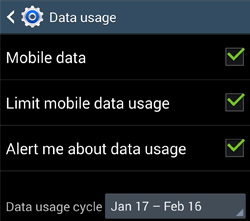 Tap Mobile Data, to enable and use the feature. Alternately, you can activate mobile data by opening the quick setting panel, and then tapping on Mobile data from the given options. Note: Charges may apply when using mobile data on your device. Please contact your carrier for more information on mobile data charges. You can connect your Galaxy Alpha to a Wi-Fi network to use the Internet or share media files with other devices. 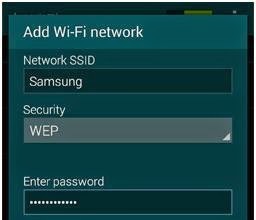 To use Wi-Fi for Internet on your new Samsung device, you need to enable the feature first. Tap the Wi-Fi switch to enable or turn the feature ON. Select a wireless network to use from the available Wi-Fi networks list. When prompted, enter a network password. When the device connects to a wireless network, it will reconnect to that same network each time it’s available without requiring a password anymore. You can prevent the device from connecting to a wireless network automatically by selecting it from the list of networks and then tap on Forget, to forget the network. Tap Add Wi-Fi network at the bottom of the list. Enter the network name in the Network SSID. Enter the Password (if it’s not an open network). Please contact your Internet service provider for information on your Network SSID, security type, etc. You can use Wi-Fi Passpoint to enable the device to search for and connect to a certified Wi-Fi network. With the Passpoint feature, you can connect to public Wi-Fi networks that support automated authentication. It will also allow your phone to search for and connect to another certified Wi-Fi network when you move to a new location. To enable Wi-Fi Passpoint feature on your Galaxy Alpha, tap on Advanced, then select Passpoint. Note: Wi-Fi Passpoint may not be available in all regions.Please contact your carrier and verify if you can avail this service. Smart Network switch is a feature used to maintain a stable network connection on your Galaxy Alpha, when you browse webpages, download contents and the like. To enable Smart Network switch on your Galaxy Alpha, tap Apps, select Settings from the Apps screen, tap Wi-Fi and then select Smart network switch. Doing so will let your phone switch from a Wi-Fi network to a mobile network automatically when the current wireless network is weak or unstable. When the wireless network becomes strong, the phone automatically switches back to the original wireless network used. And that covers everything for this guide. Please keep posted for more on Samsung Galaxy Alpha network connectivity guide to populate soon in this site. 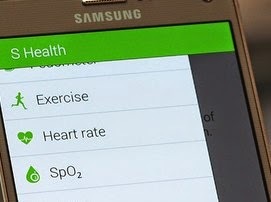 Here's a help for new owners of Samsung Galaxy Note 4 who are trying to use the S Health feature, particularly in setting up the UV intensity, SpO2 and Stress Level. S Health is an integrated feature of the Galaxy S5, and now a more enhanced and by far, the latest version is sported by the Galaxy Note 4. Similar to the previous version, the latest S Health version on the Galaxy Note 4 also has the essential functions including an exercise tracker with built-in pedometer, as well as the ability to keep tabs on food, sleep patterns, weight and your rate with the built-in sensor. As for the enhanced features, the new S Health version can now enable the phone to sense your blood oxygen saturation (SpO2), as well as the strength of the UV (ultraviolet) rays/light from the sun. Both the SpO2 and UV rays are measured using the sensor module located below the rear camera of the Galaxy Note 4. Read on to learn how to set up the UV intensity, SpO2 and the Stress Level on the Galaxy Note 4's S Health. 2. From the Apps screen, tap S Health to open the application. 3. Tap on Next from the S Health app welcome screen. 4. Read, review and then agree to the terms and conditions by placing a check on the box next to I agree. 5. Tap on Next to continue. 6. Sign in to your Samsung account (if necessary). If you choose to sign in later, then just tap on Skip. 7. In the Create Profile screen, tap in the name field and then enter your name. 8. Tap on Done to proceed. 9. Now, tap on the Gender icon, then edit the Date of Birth to your birthday using the up and down arrows on the screen. If you do not want to share your profile information with other S Health users, then tap in the box located at the bottom left corner, and then tap on Next. You will then be prompted with the Body measurements screen. 10. Enter your height and weight on the specified fields. You can also change the unit of measurements from feet and inches to centimeters, by tapping in the box next to the height details. Next, tap in the boxes and use the onscreen keyboard to change the information shown. Enter your weight and then tap Next to continue. 11. Under Activity Level, scroll to and select your Activity Level, then tap on Next. 12. Your profile has just been created. Tap on Start to begin using the S Health app and examine certain aspects of your wellness based on the apps functionality. 13. To keep track of the UV light, swipe the screen to the right then tap on UV. 14. Review the details/ onscreen instructions and then tap on OK.
15. Point or position the sensor on the back of the device directly at the sun, then tap Next. 16. If everything is set, then start measuring the UV intensity by tapping on the Start button. 17. Read the UV levels data on the next screen. You can also view the UV levels data per Hour, Day, or Month by tapping on the chart view icon located on the left corner of the screen. 18. To go back to the previous screen, tap on the Summary view icon. 19. Now tap on the Menu icon (three-vertical-dots icon) located in the upper-right corner of the screen. 20. Tap Settings from the sub-menu items, to access S Health settings. 21. To go back to the S Health app main screen, use the Back key. 2. Tap on S Health to launch the application. 3. Tap on SpO2 from the S Health menu/screen. 4. Read and review the on-screen instruction/information on SpO2, then tap OK to continue. 5. Now start the measurement by gently placing your finger on the sensor. Ensure your fingertip is on the center of the sensor and do not press too hard. 6. The S Health will now initiate measuring the SpO2. Wait for it to complete, then take your finger off the sensor when done. While the measurement is being taken, please avoid talking or moving. Also, note that the use of SpO2 on the Galaxy Note 4 S Health is not for clinical or medical use.Though you can consider this as part of your own regular wellness check. 2. Tap on S Health to open the application. 3. Swipe the screen to the right, then tap on SpO2. 4. You will be prompted with more options/functions under SpO2. Tap on Stress to measure your stress level. 5. Read and review the onscreen information / instructions and then tap OK to continue. 6. 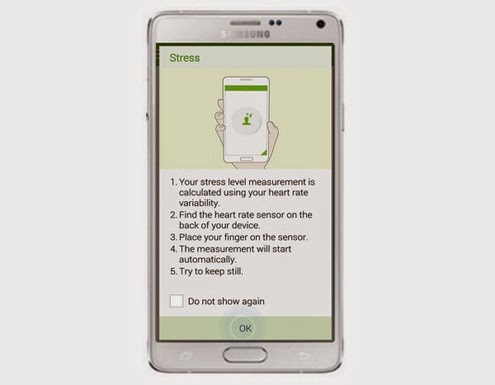 To start the measurement of your stress level, gently place your finger on the sensor. Be sure to place your fingertip on the center of the sensor and do not press hard. 7. The measurement will then begin automatically. Just wait for it to complete. 8. When S Health is done measure your stress level, take your finger off the sensor. Normally it would just take a few seconds for S Health to complete measurement of the stress level. Read and review the results when all done. Hope this helps! Samsung's new Galaxy Note 4 device integrates a voice recorder for users to record audios, use voice memos, and/or recording modes available. This guide will teach you how to use the meeting mode on voice recorder of the Galaxy Note 4. Read on to learn more. This article is aimed at helping owners/users of the Galaxy S5 with Internet problems on their device, particularly those who cannot browse the Internet. If you too can't browse the Internet on your Samsung Galaxy S5, then here's a troubleshooting guide for you to follow. Note: Be sure to test your device after completing each of the following steps to determine whether the problem has already been fixed. Otherwise, continue to the next resolution process. Some S5 owners said they are not getting any signal or service on their device while they haven't done anything that might have messed up the Internet settings so far. And this is what we are going to address in this content. Before we start, let us take a closer look on what might have triggered this issue to occur on the phone. You can set and show high quality images with My Interest as wallpaper on your new Samsung Galaxy Note 4 lock screen. My Interest offers you with different categories to choose from, including Drawings, Travel, Nature, Landscape, Night Sky, Pets, and Food. All you have to do is to select your preferred categories from which you will get new wallpaper images for download and set as wallpaper. Read on to learn how to get and set high quality wallpaper images for your Note 4's lock screen. Some people are having trouble finding/viewing the duration of their previous calls on their Galaxy S4 smartphone. Others said they can only view the duration of the most recent calls, but unable to find of any past calls they received on their device. "I'm trying to view the duration of my previous past calls as I'm trying to account my billing statement. But for some reasons, I can only seem to find the most recent one. I'm also not seeing the Log tab. My Galaxy S4 is running 4.4.2. I know it should be in there but I just can't figure out how to get to it. Please help!" Some users of the Galaxy S5 have reported Bluetooth issues with their phone, including a microphone that is not working with Bluetooth. The problem is best described when trying to call someone using a Bluetooth headset but then their voice couldn't be heard on the other end. And this is specifically the problem that we are going to address in this content. 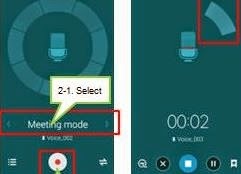 If you too encounter such problem on your Galaxy S5 microphone when making calls, then you may consider this content as your guide to fix it. To address the augmenting concern on handling large display sizes, Samsung has designed its newest Galaxy Note 4 with the most practical one-handed solution yet, called the side key panel. 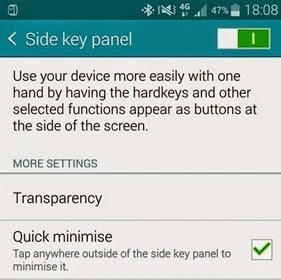 When you enable the side key panel, you will be able to access major navigation keys including Home, Menu, Back and Recent Apps, App List, as well as Reduce Screen on the side, allowing quick thumb access. You can also move the side key panel from left to right (vice-versa) of the screen, depending on your preference. Here's a quick guide for you to ensure every hardware component on your device are working just fine. You can perform a hardware test on most Samsung devices including the Galaxy S5 smartphone. Making this part of your regular device check is recommended to see and make sure the phone's basic hardware functionality, like touch screen sensitivity and display, is all good. Similar to the Galaxy Note 3, the new Galaxy Note flagship device also integrates the reduce screen feature, which you can use along with One-hand Operation. So if you are not satisfied with the current screen size of your Note 4 device, or find it big enough to view perhaps, then you can have it changed. In this guide, we'll teach you how to use Reduce screen size feature to reduce the size of your Note 4 screen. You may start whenever you're all set. 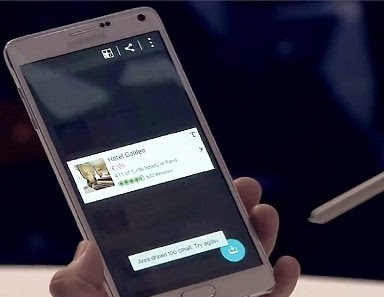 Smart Select is one of the new and enhanced S-Pen features of the new Samsung Galaxy Note 4 device. This feature is among the available functions for use with the Air Command. 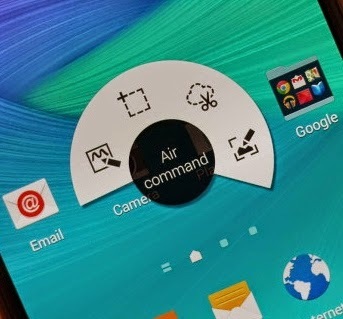 With the Air Command, you can quickly access many different functions and features of the new Note device. All you have to do is press the S Pen button while holding down your S Pen a few millimeters above the screen. A list of four available pen features will appear after you press the S Pen button, including Action Memo, Smart Select, Image Clip and Screen Write. 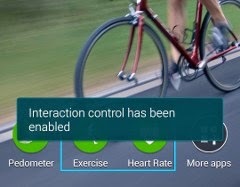 Samsung's S Health app came out this year with the company's flagship phone, the Galaxy S5. 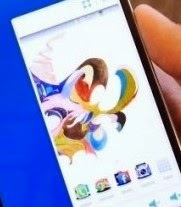 The new Samsung Galaxy Note 4, which is yet to be released, will also come packed with the but the more improved version. Users can now setup UV intensity, SpO2 and Stress Level. Learn how to set these features up and enjoy using S Health with your new phone. 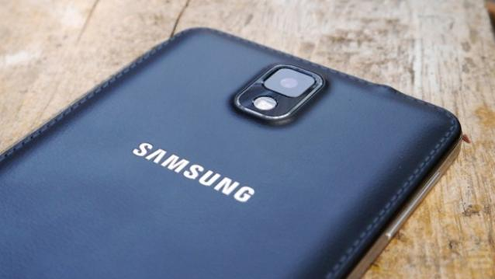 Samsung Galaxy Note 4: What is Photo Note and how to use it? Using Photo note, you can separately save and edit the text and image part from taken image. You can use Photo Note feature to capture and improve the readability of text before inserting an image of the text into your notes. Create notes by taking photos of content from various sources, such as handwritten text or drawings. You can apply the Photo note effect to make it easier to view text from a photo by deleting the background. From taken images, Photo note will automatically recognize text and images by different sections in your document and you can edit it. Similar to other Samsung mobile devices, messaging on the new Samsung Galaxy Alpha also comes in form of Short Message Service (SMS) and Multimedia Messaging Service (MMS). This means you can add or insert sound file, video clip or images to an SMS message. In addition, quick calls can also be made while viewing a conversation. This is made possible with the Galaxy Alpha's Direct Call Gesture. Direct call gesture is available for use when you're viewing with a contact that has a phone number. To use Direct call, simply hold your device towards your ear while viewing a conversation, and your phone will place a call to the contact. Another way to make a quick contact on the phone, is by touching the contact and sliding your finger to the right side of the screen. Please continue reading to learn how to use the Messaging app on the new Samsung Galaxy Alpha. 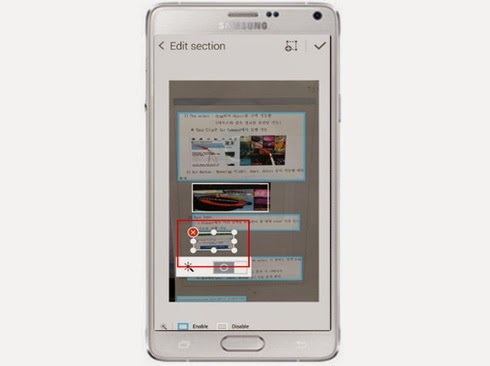 A keyboard automatically shows when you enter text to create memos or send messages on your Samsung Galaxy Alpha. There are also some languages that do not support text entry. In order to enter text, you need to change the input language and set it to one of the supported languages on your device. 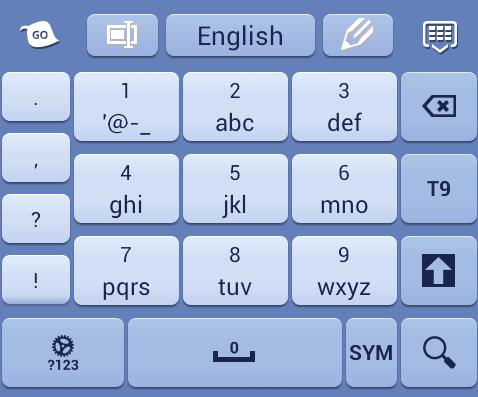 This guide will teach you how to change the input language and the keyboard layout, as well as on how to use additional keyboard functions on the new Galaxy Alpha handset. Read on to learn more. In this article, we've summed up 5 of the common questions and minor issues raised by some users of Samsung Galaxy S5 smartphone. These would include the Galaxy S5 backlight that is not working, lose connection when transferring data from an older Samsung device, SMS delivery report often prompts, device doesn't recognize fingerprint, and finally, cannot transfer S Note/S Memo files from an old Samsung device to the Galaxy S5. If too have encountered any of the aforesaid issues with your Galaxy S5, then you may consider reading this content. Similar to the Galaxy S5, the new Samsung Galaxy Alpha also offers a convenient way to hide files you don't want to be accessed or viewed by others. This is made possible with its built-in feature called the Private Mode. When you're in Private Mode, you can view all your photos, videous and other files. 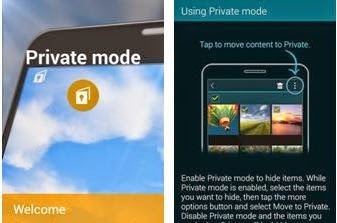 You can exit Private Mode if you let others use your device and rest assured any of your personal files will be hidden, unless they know the unlock code or pattern you've set. This guide will walk you through the steps in using, activating and deactivating the Private Mode on your Galaxy Alpha. 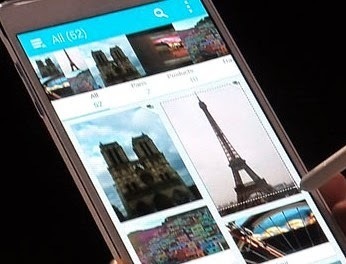 The new Samsung Galaxy Note 4 has a Selfie Mode added to the pre-existing modes in its camera. It will help you take better self portraits. Photos taken under this mode remain as is; there will be no filters nor changes to the symmetry of the face. Since Galaxy Note 4 has two cameras, there are also two ways to take a selfie depending on which camera you use. Limit your Samsung Galaxy S5's respond to on-screen touches. Read on to learn how. With Interaction control in Samsung Galaxy S5, you can restrict your phone's reaction to inputs while using apps. In order to use this mode, you would need to activate or enable it first on your device. When enabled, you then can set limit to other phone users on the access and control of your data or media. Basically, Interaction Control will help you customize the way you interact with your phone apps and settings, block or unblock areas of the screen from touch interaction/response, and likewise, disables Auto rotate screen and hard key functions on your device. Studio app is a tool you can use to add effects to a photo and edit movie clips using a complete suite of editing tools within the Samsung Galaxy S5 Gallery. Among the basic photo tuning or editing tasks you can do with the Studio app, include adjusting brightnesss, contrast, and color using a wide variety of photo-editing effects. There are several types of Studios available in the Galaxy S5 handset including photo studio, collage studio, shot & more, video clip studio, and video trimmer. 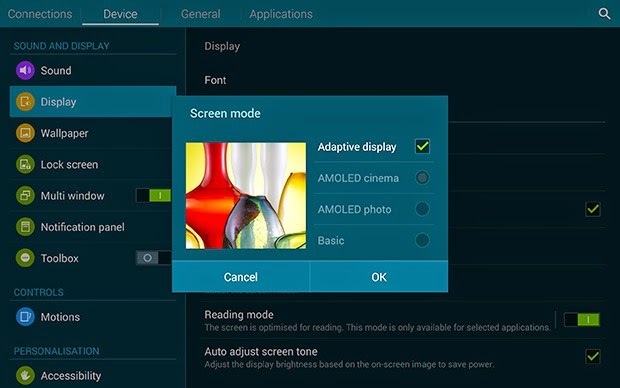 You can configure display options on your Samsung Galaxy Tab S including screen brightness, screen timeout, touch key light duration, screen mode, auto adjust screen tone, multi-window, daydream, auto rotate screen, show battery percentage and edit after screen capture. Read on the entire content to learn how to configure each of these settings on your tablet.